2. Go skiing. Winter in Jasper is all about the snow! What better way to enjoy the powder than an exhilarating descent on one of Marmot Basin’s alpine ski runs or a tranquil tour on one of Jasper National Park’s many groomed cross-country ski trails. Rentals and lessons are available. 3. Snowshoe. Snowshoeing is the traditional way to explore Jasper in the winter – and it is easier to learn than skiing! 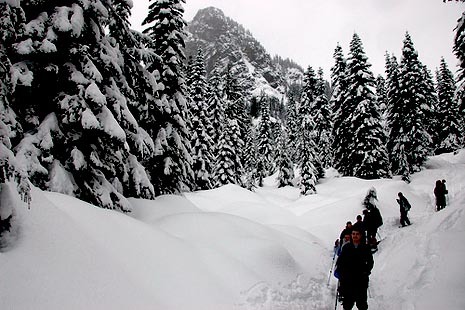 Follow one of Jasper’s many designated snowshoe trails or, if you are a skilled route-finder, make your own trail. Rentals and guided trips are available. Maps and guidebook are sold at the information center and local outdoor shops. 4. Take a Hike. Jasper is famous for its extensive trail network, and you can hike many of the valley bottom trails year-round. The trail report will tell you which ones are in the best shape. If conditions are slippery, you can buy or rent inexpensive ice cleats at many local shops. Check back next week for the rest of the list!